President Obama says other states should follow Ivy Tech Community College’s lead when it comes to connecting students to high paying jobs. Obama traveled to Indianapolis Friday to tout his plans aimed at getting more people on the track to better wage. 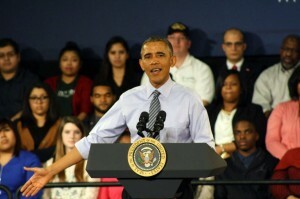 During the event at Ivy Tech, Obama once again explained his plan to make two years of community college free. The program would offer free community college to students who maintain a 2.5 GPA and graduate on time. The president says this would help incentivize people to get more training for high paying, middle class jobs. It’s what Obama calls a different way to reduce the skills gap in Indiana and the rest of the country. “This is part of what we need to do to be more creative about how do young people get the skills they need without spending as much money or taking on as much debt,” Obama said. Obama praised Ivy Tech for working with Hoosier businesses to help direct students into high need jobs, something he says the rest of the country should mimic. The president sent his budget, including his plan for free community college, to Congress this week.